I’m endorsed by Ernie Ball! Hey, in addition to writing ‘dem books, I play bass guitar and I’m tickled to announce that I am now endorsed by Ernie Ball, the world’s leading manufacturer of strings and accessories. Through my work recording and playing live for Evan Diamond & The Libary, I’m now an endorsed musician! Han’s rescue — what, exactly, was the plan? THE LAST JEDI has come under fire for nonsensical plot elements and characters making LOST-esque idiotic decisions, but if we jump in the WayBack Machine™ and take a look at RETURN OF THE JEDI, we find that nonsensical might be endemic to all STAR WARS movies — read also, if there was a “plan” to rescue Han, what the hell was it, and how did it go so wrong? This episode was inspired by Mike Ryan’s article at Uproxx on the same topic. Don’t see a “play” button above? Click here to download. This episode sponsored in part by our “SciFi Sports” series THE GALACTIC FOOTBALL LEAGUE. Ever had fun standing in line at the Post Office? Yeah, me neither. That’s why we started an account with the “Stamps.com promo code” page. Use this trial to see if the amazing Stamps.com service is right for you. We use it to ship all of our products, and we haven’t stood in line in at least a parsec. Why a new version of EARTHCORE, man? • Or pre-order from your local brick & mortar bookstore! The new EARTHCORE is straight fire. You will love it. If you buy it (only $9.99 in print), you will feel guilty that you didn’t give me more money. HEY, LUCAS JR., YOU TRYING TO SELL ME THE SAME STUFF TWICE? Scott interviews #1 New York Times bestseller Pierce Brown as Pierce kicked off his world tour for IRON GOLD, volume IV in the Red Rising saga. Recorded live at Mysterious Galaxy Books in San Diego, the exact site of Pierce’s very first appearance as an unknown author in 2014. Pierce talks about his new work, his struggles to get published, and the intense pressure that comes with following up a literary juggernaut. Don’t see a “play” button above? Click here to download. This episode sponsored by our “GoDaddy Coupon” page, which features the code CJCSIGLERC to get a new dot-com domain for just 99 cents. Story Smack is a podcast about storytelling, but I must admit we talk quite a bit about movies. Today, however, we’re going to talk about a movie maker. In fact, the most Oscar-nominated movie maker on Earth. Actor? Director? Nope — orchestrator and conductor John Williams. I know you love John Williams’ work. I know I love the Star Wars score, and the Indiana Jones score. Those are both his. But so many others you know and love are also John Williams’ work. You’ll be amazed at how much of the score to your own life is lifted from work he’s done. Don’t see a “play” button above? Click here to download. This episode sponsored in part by our “Stamps.com promo code” page. If John Williams’ movie scores move you with all the grand and sweeping sound, trust me when I tell you that you will totally love GALACTIC FOOTBALL LEAGUE the series by #1 New York Times bestselling author Scott Sigler. It’s got everything: humor, tragedy, galactic politics, criminal intrigue and hard-hitting alien American Football action all come together in a series described as STAR WARS meets THE GODFATHER meets THE BLINDSIDE. Start your grand adventure with THE ROOKIE, Book One. Hard to believe it’s been twenty years since Good Will Hunting was released! Hard to remember a time when Matt Damon and Ben Affleck were small time enough to be caught in development hell trying to get this movie made. Back before they were Oscar winners. Thankfully they got through all of that, and Good Will Hunting stands the test of time! Join us while we discuss the good, the bad and the legend that is Good Will Hunting. Don’t see a “play” button above? Click here to download. This episode brought to you by our GoDaddy Coupon. Have you checked out our Audible Free Trial? Honestly, if you spend any amount of time in the car, you might as well try it out for free. You get 30 days to see if you dig it. If you don’t, just cancel, pay nothing, and keep the free audiobook. You really can’t go wrong with that! I am in no way, shape or form an expert on firearms. Scifi classic, or classic trash? You have your opinion, we have ours, which we share in this lovely recap of an extremely fun and slightly polarizing movie that came out twenty years ago. So come on, you apes — do you wanna live forever? Dive into this delightful cheese-fest with us. Would you like to know more? If you like the football scenes in STARSHIP TROOPERS, you will love GALACTIC FOOTBALL LEAGUE the series by #1 New York Times bestselling author Scott Sigler. Humor, tragedy, galactic politics, criminal intrigue and hard-hitting alien American Football action all come together in a series described as STAR WARS meets THE GODFATHER meets THE BLINDSIDE. Book one, THE ROOKIE, is the perfect book-report project for your high school or junior high athlete. Chinatown — the perfect screenplay? In this week’s episode Scott and I discuss the storied screenplay for Chinatown. The movie came out in 1974, and the screenplay has been heralded as near-perfect since then. There is a lot to unpack and discuss about the movie, the script, the crew and the era of American filmmaking, so jump right in! It’s a lovely movie. A throw-back noir, featuring Jack Nicholson and Faye Dunaway, is based on an original screenplay written by Robert Towne. Towne won the Best Original Screenplay Academy Award for his effort. • Get it here, sucka. Don’t see a “play” button above? Click here to download. This episode sponsored in part by our Audible Free Trial page. We’ve heard so many lovely comments about Story Smack. I’m thrilled you’re digging our discussions, and especially excited that some folks are delving into movies they’ve never seen before. If you should find yourself wanting to blog about it, you should check out our “GoDaddy Coupon” CJCSIGLERC, which gets you a brand-new dot-com domain for just 99 cents. We recorded our coverage of this cult classic live at SiglerFest2k17 in Las Vegas. Junkies (the fans of Scott Sigler’s books) got to ask us questions. Also, there were many White Russians, so don’t count on Scott or ARealGirl to be all that sharp in their responses. Drunken StorySmack is the 300 game of podcasting! Don’t see a “play” button above? Click here to download. This episode sponsored in part by our Audible Free Trial page. Get some books on bowling, man. We’re finally back from Las Vegas and getting to work. Pretty much everything is put away until next year. Focusing back on our websites, and considering a StorySmack site! Like me, you should check out our “GoDaddy Coupon” CJCSIGLERC, which will score you a brand-new dot-com domain for just 99 cents. Maybe for when you start your own podcast, or website, or blog! We recorded a live Q&A episode for THE RIDER, featuring a more-than-slightly intoxicated FDØ. We were at SiglerFest2k17 in Las Vegas with many Junkies. The theme of the weekend was “The Sig Lebowski.” The FDØ was four (or five) white Russians in. We hope you enjoy this episode, we hope you loved THE RIDER, and we hope you’re back next week for the first episode of ALONE, Book III of the Generations Trilogy. Like audiobooks? How about you get one for free as part of a no-risk Audible Free Trial? You can get Scott’s next podcast novel, ALONE, Book III of the Generations Trilogy as an ad-free, uninterrupted, unabridged audiobook. Get some. These advertisers keep your stories free: Hate standing in line at the post office? So do we, which is why we use our Stamps.com promo code, page, where you can get $40 in genuine USPS postage as part of a trial offer. Print postage using your printer and your computer, slap it on your package (awwwww yeah …), hand it to your postal worker (double awwww yeah …) and you never have to visit the post office again. • Imagine a story that combines STAR WARS with THE GODFATHER with THE BLINDSIDE. That story exists, an American Football tale known as THE ROOKIE, Book I of the Galactic Football League. We’ve arrived at the final episode for this awesome novella. Find out how the teammates fair after they dismount from their trusted mounts after the final game of the season. It’s been too long since I mentioned how great it has been working with Stamps.com for our business. They’re easy, flexible, and always available right from my own computer. Our Stamps.com promo code page is also great, as is using the code SIGLER for a $110 bonus offer that includes $45 in free postage and a digital scale. Don’t like it, don’t keep it! But keep the cool gifts! These sponsors keep your podcast free: So, it’s been a while since you blogged? Yeah, me too. I’ve got lots of domains, now I just have to use ’em. If you want to collect domains, go to the GoDaddy Coupons page, which features the code CJCSIGLERP, which saves 30% on your entire order of new products. • Did you like the far-future world you get to see in THE RIDER? Find more of it when you head on over and take a gander at our “American Football” and space all mixed up into one! Jerry Before Seinfeld is a look back by one of the most successful comedians in the world. We starting watching thinking it would be an hour of comedy, only to find an origin story instead. Scott and A discuss this surprising and charming special. Starting up a new venture? Need a killer website? Check out our “GoDaddy Coupon” CJCSIGLERC, which will score you a brand-new dot-com domain for just 99 cents. It’s really a great deal on a great product. Game on! The Lashing at Loppu is about to get underway, and everything is on the line for Pete, Bess, Ian, Dar and the Ridgebacks franchise. Unleash the velociraptor, ladies and gentlemen, and let’s get ready rumble! I am reading and really digging the Sandman Slim books by Richard Kadrey. You should sign up and listen to them on your commute. Especially if you live in LA. 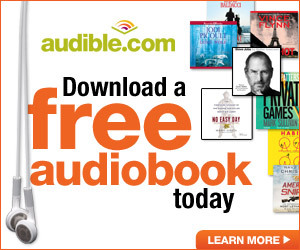 Try our Audible Free Trial and pay nothing. Audible’s 30-day trial lets you test out their service. If you don’t like it, cancel and pay nothing, but keep the story of Stark for free! These sponsors also keep your podcasts free: Someday you’re going to find yourself in need of cool art. When you do, our 99designs coupon page will be your BFF. • What does Quentin fear more, the aliens on the field, or losing to them? Find out in THE ROOKIE, Book I of the Galactic Football League series, a scifi spin on American Football. • And we always love our GoDaddy Coupon page because it’s chock full of great savings and awesome deals. 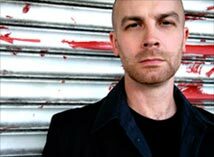 New York Times best-selling novelist Scott Sigler is the author of ANCESTOR, INFECTED and CONTAGIOUS, hardcover thrillers from Crown Publishing, and the co-founder of Dark Øverlord Media, which publishes his Galactic Football League series (THE ROOKIE, THE STARTER and THE ALL-PRO).